Daarvoor leverde Henri Krop een bijdrage, n.l. Hierna neem ik (zonder de verwijzingen) de inleiding en de conclusie van het artikel over. Het geeft een duidelijk verschil van benadering aan van Henri Krop en Wiep van Bunge enerzijds en Jonathan Israel anderzijds op de betekenis van Spinoza en zijn kring voor de secularisatie. INTRODUCTION: "SECULARISM" AND HEGEL'S "PROTESTANT PRINCIPLE"
In the preface to the Philosophie des Rechts (1820), Hegel coined the phrase "das Prinzip des Protestantismus." This principle addresses human autonomy and freedom. Philosophy made this religious principle "real" and Enlightenment philosophers and French revolutionaries accomplished the work Luther began. By removing the obstacles between God and man, Protestantism had abolished the medieval separation between clergy and laity. Man regained the true consciousness of God's infinite love, and this love transforms society as a whole. Luther's reformation implied a revolution of human life. The medieval Church subverted human morality by promoting the belief in an afterlife and imposing continence, celibacy, and poverty, which undermine the virtues of civil society. Roman Catholicism preserved "this separation of the religious from the secular." According to Hegel, Luther's revolt implied the "secularity" (Weltlichkeit) of Christianity by integrating religion into the world and making it part of our life. Hegel's concept of secularisation implied a rationalisation of religion and an immanent morality. In this paper, I would like to argue in favour of the thesis that Spinoza's philosophical project implied secularisation in Hegel's sense. This position, I will establish by outlining not only Spinoza's views, but also the highly controversial ideas of Jarig Jelles (1620-1683), Adriaan Koerbagh (1632-1669) and Lodewijk Meyer (1629-1681). Jonathan Israel links Spinoza with secularism but in another sense. He observes: "Radical Enlightenment has been the 'general rationalisation and secularisation' of Europe, which set in after 1650." By challenging Christianity, radical philosophy decisively contributed to creating "modernity." This "radical philosophy" emanated from Spinoza and his allics. Unlike Hegel, Israel suggests that "radical philosophy" culminated in atheism and materialism. However, as Wiep Van Bunge argued, Spinoza and his friends focused on God. They asked for the purification of Christianity from superstition, such as belief in miracles and mysteries, rather than its abolishment. Spinoza's circle wanted the Church to become integrated into society and all privileges of the clergy to be eliminated. These ideals of rationalisation and equality fit well within the program of the Radical Reformation. The "secularisation" envisaged by Spinoza's circle is inextricably linked with a political project. In the preface to the recent edition of Koerbagh's A light, van Bunge draws attention to the fact that the members of the circle supported the civil power agenda of the so-called States Party. Spinoza's Tractatus Theologico-Politicus (henceforth TTP) may well be read as a piece of propaganda upholding the view of the States Party. In the preface, Spinoza maintains that the state he lives in is an ideal state. However, the clergy, driven by their lust for power, threatens the peaceful existence of the Republic. According to the German historian Schilling, the anticlericalism of the States Party originated in the party strife during the so-called Regime of True Freedom, but its "Republicanism" did not exclude a general Christian outlook and a Biblical underpinning. The secularism these radical philosophers argued for was an attempt to solve the divisive problems challenging social unity in the Dutch Republic. In this paper, I will examine the concept of "rational religion" developed by Spinoza and his circle and its implications on the Bible (Section "On Religion and the Bible"). Naturalistic morality originating in human desires or affects and an exclusive concern with this world will then follow (Section "Secular Morality in Koerbagh, Jelles, and Spinoza"). And, finally, I examine the complete subjection of the church to the authority of the state, which is supposed to lead to the creation of "a Heaven on Earth" (Section "The Abolition of the Ecclesiastical Power"). Before dealing with these topics, the next section will focus on "the circle of Spinoza." Spinoza's philosophical project may be studied as part of the movement. Although the TTP does not convey that Spinoza shared Koerbagh's and Meyer's optimism with respect to the emancipatory powers of reason, Spinoza's circle shared a common view on religion, which firstly implied that true religion could be based on reason alone, simple and purified of all mystery and of the Roman-Catholic superstition. A naturalistic morality coincides with such a rational religion. Secondly, Spinoza's circle was influenced by Socinianism and, thirdly, it pleaded an ardent anti-clericalism, convinced of the moral perversion of a church striving for political power. I hope to have substantiated the claim that the texts of Jelles, Koerbagh, Meyer and Spinoza, mostly written during the five years between 1665 and 1670, should be read as political interventions in the public debate during the "Era of True Freedom," the first period in which the Dutch Republic had no stadtholder. 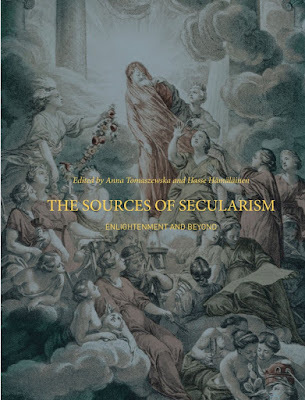 However, they are also a part of the history of secularisation, a process in which, from the Reformation onwards, religion has been gradually deprived of its "sacred" nature and integrated into the world. In this manner, religion has been incorporated into our moral life. Gepost door Stan Verdult op 11:25 p.m.